Thus continuing my love of brightly colored landscapes and a desire to make brightly colored paintings. This painting was accomplished with a watercolor underpainting, watercolor pencils for the trees, and hard pastels for the foliage texture. I chose this particular picture to paint, because I really liked all the wild, natural colors. I first applied masking fluid to all the trees to save the white. 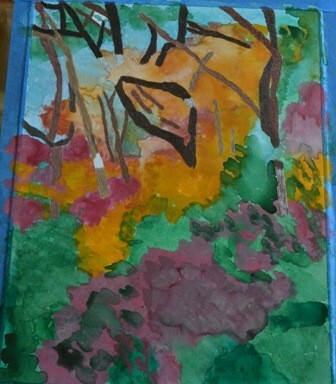 Then I laid down a multi-colored watercolor underpainting roughly corresponding to the colors of my desired endstate. I didn’t try to be very restrictive in the sense of coloring in exact lines, but rather a bit more free flowing and abstract. After the underpainting dried, but before I applied the foliage texture with hard pastels, I used watercolor pencils for the trees. 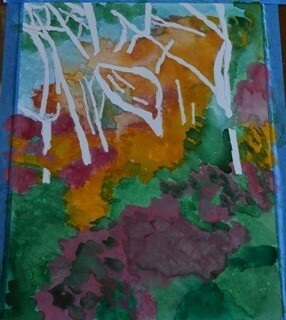 I pulled up all the masking fluid and laid in the trees with a variety of colors. I like watercolor pencils more than normal colored pencils, because I can layer all the colors and the detail like a normal colored pencil, but then I can make a rich, controlled wash with the watercolor. 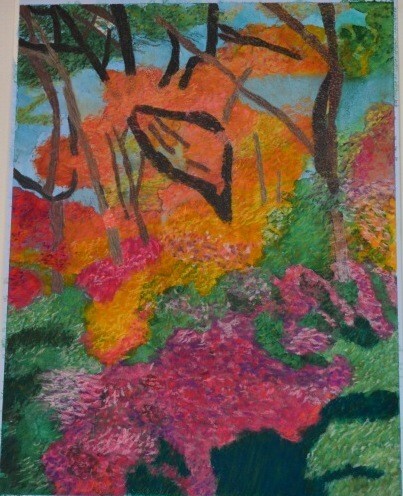 Then I finished up the painting by applying layers of differing colors of hard pastel to recreate the image of foliage. This was my reference photo. It was taken during a nice day hiking in Palgonsan Provincial Park one Saturday afternoon in October. I was completely taken by all the natural colors. Palgonsan Provincial Park was very easy to reach. I just took one of the numerous KTX trains from Seoul Station down to Dongdaegu, which was only about two and a half hours away by express train. The local bus number 1 out to Palgonsan Park and then just hike to your heart’s content and enjoy the beautiful Donghwa Temple and the beautiful nature. It made for an easy and pleasant full day trip. My painting is certainly not photo realistic, and part of me wishes that it was. 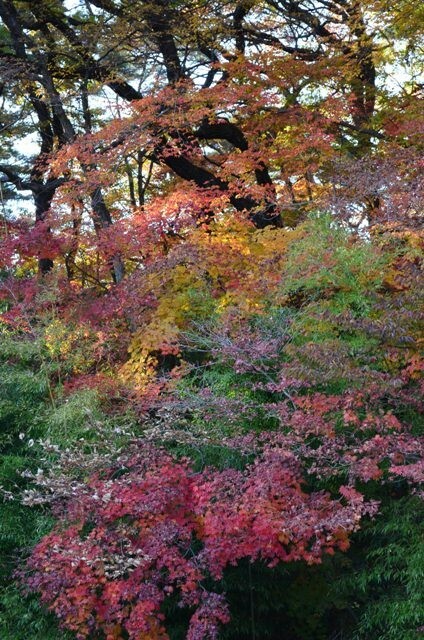 But another part of me likes the more impressionistic nature of the painting and thinks it captured the abstract colorful nature of that autumn foliage. I still need to work on representing light sources accurately. I’ve been trying to branch out my technique and move away from attempting to recreate the reference photo as much as possible, to a more abstract capture of the scene. I spent two weeks in Iceland in March 2011. I made the conscious decision to visit Iceland in the winter, because I wanted to see the Icelandic winter landscape, and especially wanted to see the Northern Lights. Thingvellir is a day trip from Reykjavik and is the site where the Icelandic parliament was founded around 930 CE. 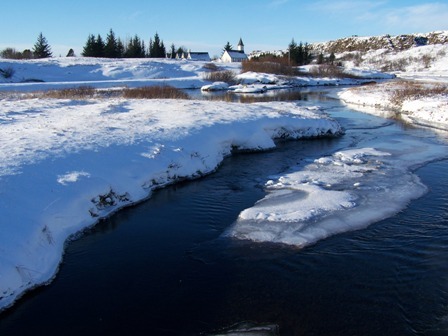 Thingvellir is the place of a beautiful rift valley and the largest natural lake in Iceland, Thingvallavtn. I went out to area twice during my visit. One of the visits was to snorkel and the other time just a bus trip as part of the Golden Circle day trip. There is a lot I like about this painting and a few things that give me pause. I laid down a watercolor underpainting and overlaid hard pastels and watercolor pencil on top for the detail. I especially like the depth created on the ice formations with the blue pastel water, overlaid with indigo blue watercolor pencil to give depth to the scene. 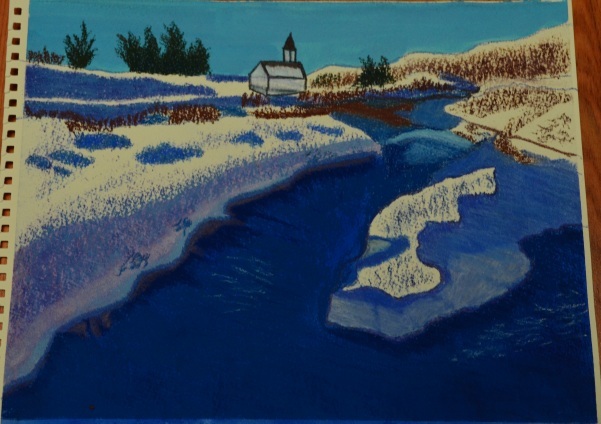 After some thought, I decided to create the shadows in the snow with a lavender watercolor underpainting and light blue and violet hard pastel for texture and shadow. The ice formations was created with blue, gray and white watercolor pencil and burnished to give the appearance of a smooth ice surface finish. The parts of the painting that I felt I could improve the most is the background and distance. I could improve the water reflections in the distance. I also realized after the fact that I drew the church way out of perspective. The church looks way bigger in the painting than it was in reality. I feel I need to improve creating a background with depth and texture to make it look more realistic. This was one of those paintings that I wasn’t sure about when I first decided that I couldn’t make it better, but it did grow on me over time. Above is the reference photo I used for this painting. I really loved Thingvellir, though truthfully I loved all of Iceland. It was a remarkably beautiful country. This day was very cold, sunny and bright and it just accentuated the fabulous natural of this special country.